Top row (left to right): 1. unidentified, 2. Libby Cecil, 3. Laura Cassell, 4. Anne Fernberg, 5. Michelle Yano, 6. Jerry Sandoval, 7. unidentified, 8. Wylie Fabyan, 9. Lisa Gibbs. Second row: 1. Donald ?, 2. Julie Brierly, 3. Carl Karfs, 4. Suzanne Bohrer, 5. Jeff Norris, 6. Karen Gardener, 7. Donna ?, 8. unidentified, 9. Leslie Day. Third row: 1. Dennis Gee, 2. Brenda Tatjees, 3. unidentified, 4. 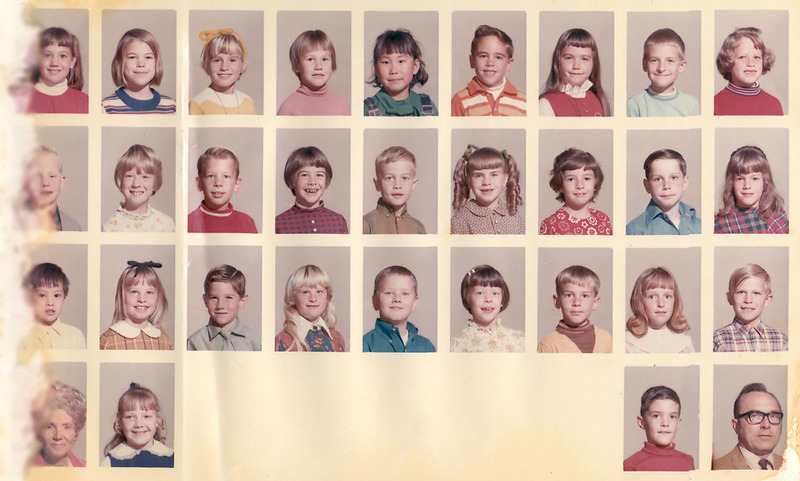 Lori Woodard, 5. unidentified, 6. Donna Kraft, 7. Thomas Wood, 8. Shannon White, 9. unidentified. Fourth row: 1. Mrs. Coache, 2. Kimberly Minor, 3. no picture, 4. no picture, 5. no picture, 6. no picture, 7. no picture, 8. Mark Weingardner, 9. Mr Donald Larsen (Principal). Credits: From the collection of Laura Cassell. Laura's picture has suffered some water damage on the left (which I have blurred to minimize the distraction). If you have copy of this picture that is in better condition, please scan it for the archive. Thanks to Laura Cassell and Jeff Makaiwi for identifying the kids in the picture.